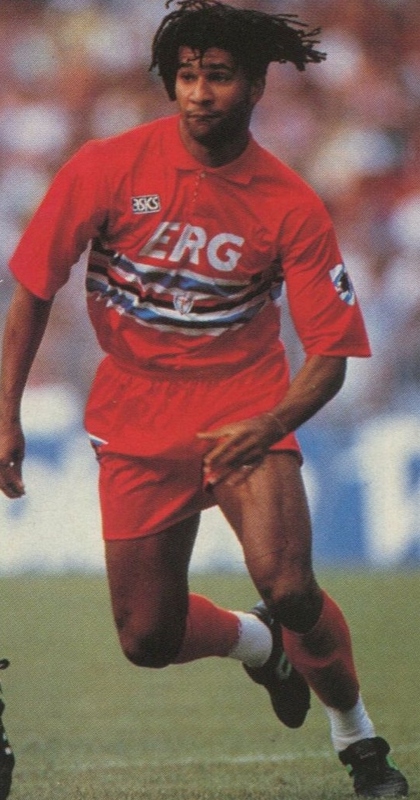 The first time I saw a Sampdoria third kit was in 1993, a picture of the newly signed Ruud Gullit in Match magazine – possibly from the same game as this one. Red seemed an eminently logical choice – after all, my own imaginary club had a blue home, white away and red third – but the excessive striping left me a bit unnerved. Essentially, the red kit had the same as that which appeared on the white away kit, blue stripes flanking the white-red-black-white of the home, but there were two extra narrow white stripes too. To my mind, swapping the blue and red from the home kit would have been sensible, though I wasn’t aware of the symbolism of the red and black together in terms of the club’s origins. Even if that wasn’t possible, surely the blue didn’t need the white outline against the red? Well, it did, for reasons which will make sense as we go back four seasons previously, to 1989-1990. Despite having lost the 1988-89 European Cup Winners’ Cup final to Barcelona, Samp had retained the Coppa Italia and so were back in the continental competition. Wins over Brann and Borussia Dortmund brought them to the quarter-finals in March 1990, with Grasshopper Club Zurich of Switzerland the opponents. Of course, Grasshopper play in blue and white halves – believed to be a Blackburn Rovers tribute – so both Samp’s blue home and white away shirts (which had the striping veritcally – it wouldn’t reflect the home style until 1990-91) would have clashed. A third kit had only been worn once in the club’s history, at Brescia in 1981-82, but one would be needed again. Over a Thursday night meal at Edilio restaurant in Genoa, Samporia strikers Roberto Mancini and Gianluca Viallia decided to consider their sartorial options. According to the wonderful Samp kit history book la maglia più bella del mondo, Mancini actually sketched out three suggestions – red, yellow and his own preference of black, all featuring the blue, white, red and black banding. When he showed it to the decision-makers, they felt the black would cause problems with match officials and so the red was pressed into production (note the absence of the Baciccia sailor crest on the left sleeve – more on that in the near future, from Les Motherby). And the white gap between the red and blue? Well, Samp’s rivals Genoa wear red and navy halves, so it was felt that any comparison had to be avoided and the red and blue couldn’t touch. Having won 2-0 in Genoa, Sampdoria triumphed 2-1 in the away leg and Monaco and then Anderlecht were seen off as the club went a step further than the previous year and lifted the trophy.